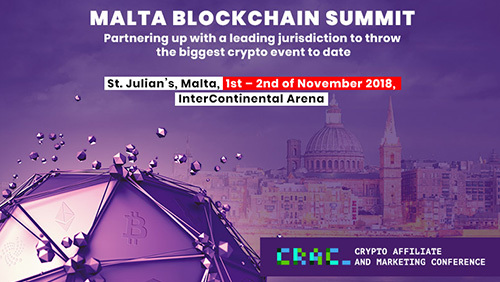 St Julian’s, Malta, 1-2 November 2018 – Upon receiving an unofficial status of the “Blockchain Island” after passing an array of crypto business regulation bills, Malta is ready to welcome more than 5000 delegates, 100 speakers and 150 companies at one of the biggest gambling and blockchain events – Malta Blockchain Summit. Such massive companies as Binance and OKEx have already chosen Malta for relocating their headquarters, and this is just the beginning for Malta, that keeps making the regulatory environment for blockchain-based businesses better and better. developers. Everyone will be able to find something to one’s taste. Gambling industry will get a special spotlight at the summit. Regulation of this area is the key problem all over the world, and finding the solution for it will be the main task of dozens of major gambling networks, affiliates and crypto exchanges, supported by the Maltese government. The gambling industry delegates will have unique opportunity to network, exchange their experience, learn new marketing strategies, as well as to learn everything about the blockchain technologies implementation. Moreover, they will get a chance to inspect local gambling licencing terms, meet the MGA members and the prime minister of Malta himself, who will be among the speakers at the summit this year. Eman Pulis, Managing Director of the Malta Blockchain Summit.